Brick mobile phones from the 80s are rapidly becoming a cult retro item. They were very expensive when new and at first used only by top executives and City traders. By the end of the decade, they were an invaluable business tool for travelling salesmen, builders and delivery drivers as well, but were out of reach for personal use for most people. The hand held mobile, as opposed to a heavy transportable essentially a handset attached to a 12v car battery, was a status symbol for Yuppies in the 80s and a source of irritation on trains and in restaurants for everyone else. Only the 2G digital phones of the 90s made today's mass mobile phone ownership possible. The original mobile phones from the 80s were referred to as bricks, because they were as big as a house brick. In the 80s, mobile phone users were rare a sight and the size of the handset made their users stand out in a crowd. The brick size, together with their exclusivity, makes retro mobile phones from the 80s collectible today. A mobile phone is essentially a phone that uses radio waves rather than wires. Radio telephones were possible in the Second World War. However, it needed transistor technology to make them small enough to carry around. From the sixties onwards, the emergency services made use of radio telephones. The police walkie talkie was an example of a portable early radio phone. However, the range was short and few frequencies were available. A few individuals could afford radio phones in their cars in the 70s and in the early years of the 80s. However, a very small number of channels were available and new customers had to join a waiting list. A new system, the cellular system, promised change. The purpose of the cellular system was to make best use of the limited number of channels available. To get an idea of how limited a resource the radio channels were, the Cellnet system operated jointly by BT and Securicor, initially had 300 voice channels to cover the entire network. The cellular system divided the area covered by the mobile network into cells. Each cell was adjacent to six other cells. You can think of cells as a patchwork made from hexagons. When a call was made it went initially to a receiver/transmitter for that cell. The call was then routed via other cells or the landline network to its eventual destination. The phone needed two channels, or radio frequencies, to communicate on to send and receive voice. To avoid clashes adjacent cells could not use the same frequencies. So based on the hexagon layout, one cell could use one seventh of the available frequencies. Depending on the size of the cells, a small number of frequencies could be made to go a long way. There was an invisible handover procedure as a phone moved from one cell to another, for example a car phone in a moving vehicle. On 1 January 1985 Ernie Wise made the first cellular call in the UK on the Vodafone system operated by Racal. It was very quickly joined by the Cellnet system operated jointly by BT and Securicor. The Government played a big part in the make up of the early mobile phone network. Only two network providers were authorised, Cellnet and Vodaphone. Neither network provider could supply contracts or cell phones directly to the public. Each supported a network of independent retailers. This was meant to ensure competition. There was some debate as to whether we had a true competitive environment amongst mobile providers, especially when prices of phones plummeted in the late eighties, but charges for using the networks did not. Some of the early mobile phone retailers were Phone Inn for Cellnet and ECT Cellular, run by Marc Albert, who at one time in his life cleaned Datsuns for a living. ECT Cellular was, in 1987, the largest independent Vodaphone service provider. 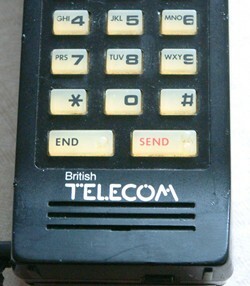 British Telecom marketed a number phones made by other manufacturers under names Pearl (Mitsubishi), Opal (Motorola DynaTAC 8000S) and Coral (made by Japanese firm Kokusai). By 1986 Cellnet had 31,000 customers and Vodafone 25,000. Those customers were initially top business executives and City traders. The cost of mobile phones in those early days was prohibitively high. 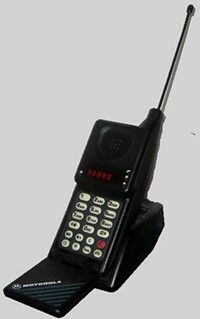 A Motorola 8000X, the world's first hand held mobile phone, cost 2990 [over 6000 in today's money]. The cost did not end with the phone itself, subscription charges and call charges were also high. The hand held phone quickly became a status symbol. It was a common sight and sound in top London restaurants in the second half of the 80s, causing annoyance to other customers. Mobile phones were also making their presence felt on trains and on the streets. The status value of the early hand held, or hand portable mobile phones, is partly illustrated by the film 'Wall Street' (1987). Gordon Gekko (Michael Douglas) uses a Motorola 8000X (or possibly an 8000S) whilst on the beach. Up and coming junior stock broker, Bud Fox (Charlie Sheen) uses public phone booths to call Gekko. In real life, stock broker, Sean Murphy, made good use of his mobile phone and his native Gaelic tongue. After a meeting at Alan Sugar's Brentwood offices he sat back on the coach to the City listening to rival analysts discussing the results on their mobile phones. He then was able to tell fellow Irishman, Conor McEnroy, at head office that they had all revised their forecasts downwards in his native Gaelic tongue, without fellow passengers overhearing. 80s cell phone users thought little of using them on the move in their cars. A MORI survey from 1988 confirmed that over half of mobile phone users were happy to make calls whilst driving and only 12 percent were prepared to ignore incoming calls, even when driving at high speed. The Motorola DynaTAC 8000X was manufactured in the US by Motorola. Americans got cell phones two years earlier than the UK in 1983. The Motorola 8000X was available in three colour schemes: dark grey, tan and grey or tan and white. Dyna is derived from the Greek and means power. TAC stands for Total Area Coverage. The slightly cheaper Motorola 8000S, introduced in 1985, had one fewer function key. In 1987 Motorola introduced the DynaTAC 8500X. This phone was more common in the UK. It added another function, a 'name' key and came in black and grey. The name key allowed the storing of callers' names. This was an advance over the 8000X. The 8500X had an alphabetic keypad to support this feature (right). The Dynatac 8500X has larger LEDs than the 8000X or 8000S. In the US the Motorola Dynatac 8000M is more common and followed on from the Dynatac 8000S and 8000X phones. It also has larger LEDs than the 8000X and 8000S. This is the main way to tell these phones apart. A challenge to the dominance of Motorola came surprisingly from Finland in the early to mid 80s. The Nokia company initially manufactured paper and rubber products. More recently it branched into the manufacture of colour televisions. The first Nokia mobile phones though were branded as Mobiras. Mobira Oy was originally a joint venture between Nokia and Salora Oy to make VHF radio equipment. Nokia bought Salora in 1984 and changed the name of Mobira Oy to Nokia-Mobira Oy. Nokia first entered the cell phone market with a radio phone called the Mobira Senator. Nokia-Mobira also launched one of the world's first transportables, the Mobira Talkman, in 1984. The Nokia-Mobira Cityman was a newcomer onto the handheld mobile market in 1987. Russian Head of State, Mikhail Gorbachev was handed one to receive a call in 1989, a marketing coup for Finnish firm Nokia. The Cityman used hard edge 80s styling and set the pace in design. 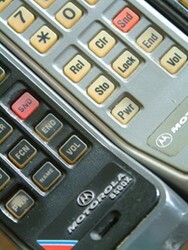 Earlier phones by Motorola were more conservative. Their two tone look was more reminiscent of an earlier era. The Nokia Cityman was truly a phone for the 80s, a time obsessed with style and image. Nokia originally marketed the Cityman as a Nokia-Mobira Cityman. I have seen various model numbers quoted: the Cityman 450, Cityman 900 and Cityman 1320. Nokia's worldwide sales increased 28% in 1987 and by 1988 the Finnish firm held 13.5% of the mobile phone market. In the UK, Nokia-Mobira sales were around 9 to 10% of the total UK cell phone market. British Telecom marketed mobile phones through a separate operation, 'BT Mobile Phones', essentially rebranding other manufacturers' mobile phones. Their first hand held mobile was the British Telcom Opal , a rebranded Motorola Dynatac 8000S. In 1986 they added the BT Pearl which was made by Mitsubishi then later the Coral by Kokusai and the Ivory, also made by a Japanese manufacturer. Two British companies did though enter the mobile phone market, Orbitel, owned by Racal and Plessey, and Technophone. Technophone was a company set up in 1984 by Nils Martensson, a Swedish radio engineer who left Ericsson to set up on his own in 1978. Technophone manufactured the Pocketphone, 7 inches tall, 3 inches wide and 1 inch deep: pretty small for the time. By early 1986 they were turning out 1000 pocket phones a month sold through Excell Communications as the Excell M1 and M2. Technophone was bought by Nokia in 1991. The Pocketphone cost £1990 to buy out right or £11.99 a week to lease. The Pocketphone worked on both Cellnet and Vodaphone networks and could change networks at the push of a button. Another challenger to Motorola's dominance was Japanese manufacture NEC (formerly the Nippon Electric Company). NEC launched the NEC 9A handheld mobile phone in the UK in Autumn 1987. It was well received by the dealers, being smaller and lighter than its rivals, as well as offering more functions. It quickly became the fastest selling hand held mobile phone. Initially the NEC 9A was relatively expensive. Only Nokia and Phillips asked for more money for a mobile handset. With so much competition, Motorola acted to maintain its market share by cutting the cost of hand held cell phones by 20%. This action started a price war which sent the cost of basic hand held phones tumbling. By the end of 1988 it was possible to get a basic, hand held phone for 500 [still over 1000 in today's money]. Mobile phones were still mainly a business tool, but those further down the corporate pay scale were now able to get their hands on one. Peter Waller, MD of Cellnet, claimed his window cleaner used a handheld mobile phone to take orders whilst he was up a ladder. Mobile phone use caught on quickly in spite of the early high prices of the phones. By Autumn 1986 there were 100,000 UK customers. Recal-Vodaphone had taken the lead from Cellnet. By Summer 1987 there were 200,000 UK mobile phone customers. Cellnet refused to disclose numbers, but it was clear that Vodaphone was ahead. As mobile phone use spread, more business users were able to take advantage of the new technology. Cell phones became useful for travelling salesmen and delivery drivers. However, these people had to be content with a car phone or transportable, essentially a handset attached to a 12v car battery. The hand held mobile was still highly praised. Even as late as 1990, the then England Football Team Manager Bobby Robson's purchase of a Nokia Cityman made the news. London taxi cabs got mobile phones in May 1987, supplied by Capital Taxiphone, which was backed by Racal-Vodaphone. In October 1987 National Express coaches were equipped with mobile phones. They also appeared as mobile payphones on InterCity trains. From 1988 it was possible to make mobile payphone calls from aeroplanes using BT's Skyphone service. Skyphone used INMSRSAT and communicated directly with BTI's Goonhilly Earth Station. Mobile phones had become an invaluable business tool by the end of the 80s, but the analogue cellular network could only accommodate comparatively few subscribers. It needed the introduction of the 2G digital network for mass ownership to become a reality. In the 80s, pundits thought mobile phones would get smaller. Many thought that they would follow the example of pocket calculators and shrink to the size of a wristwatch or credit card. Motorola regained their advantage in the mobile market at the end of the 80s with the MicroTAC 9800X introduced in 1989. This was the world's first flip phone, a precursor of the modern clamshell. The aerial popped out when the phone was opened. It was not actually functional, but market research showed people liked an aerial. The Official British Yuppie Handbook shows a Yuppie gent in a suit holding a beige phone with an aerial. It is cordless phone, not a true mobile phone. The original gadget-obsessed Yuppies bought cordless phones before mobile phones became available. Improvements in technology meant that cordless phones became cheaper in the 80s. By 1985 the £100 price barrier was broken. In 1986 you could buy a Uniden cordless phone for £99.95; Dixons retailed the CSI 2200 for £84.99 and Comet the Betacom C1000 for £89.95. There was talk of using cordless phone technology to produce a basic mobile phone for the general public, but it never caught on. The Novaphone was a cross between a cell phone and a pager. The Novaphone had a car phone which could be contacted from anywhere in the world, but could only make a number of pre-programmed outgoing calls. The pager was a small pocket device that you could take with you when out of the car. If you were still in range, the pager would receive a signal from the car phone. If you received a call on the car phone, it would page you and you could either hold the call until you got back to the car, or have it transferred to another preset number. A mobile for the shower? Can you use a mobile phone in the shower? You could probably use this one! This sponge mobile phone was made by Boots the Chemist in the late 80s. Looking at the keypad it is actually replica of a cordless phone, but it was probably meant to be a mobile. Can you use a retro mobile phone today? The short answer is no. All the phones featured in this article use the original analogue cellular system and will not work on today's networks. None will accept a modern SIM card. However, there was some overlap in design when the 2G digital system came in. The Motorola 3200 for example, looks very similar, although not identical, to the 8000 and 8500 series phones made in the 80s. It does work on the new system. Later versions of the Motorola MicroTAC also work on the new GSM system. There are also modern retro style phones available that work on the GSM system. They look like some of the earlier Motorola phones, but are much lighter. The definitive mobile phone history site - Mobile phone history. 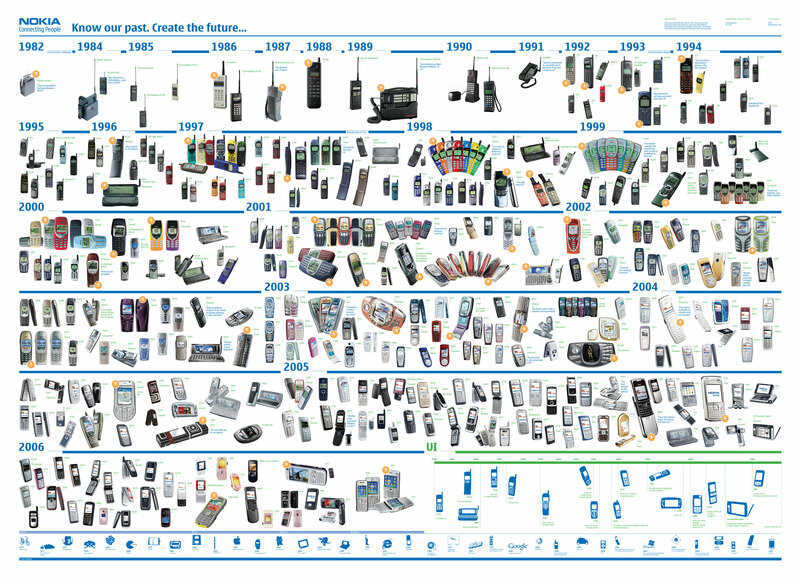 There is a pictorial history of Nokia phones from 1982 to 2004 on this Nokia mobile phones timeline. This timeline also covers the Technophone, which became a Nokia brand in 1991, as well as the Nokia and Mobira Cityman mobile phones. There were mobile phone in the 60s see: Retro mobile phone. You can buy brick phones on eBay. Most will not work today, because they are on the old analogue system. However, it's great to own a piece of history. If you want a phone you can use today get the Motorola 3200. It was made in the early 90s, but looks just like a brick phone from the 80s. It was the last true brick phone made and the only one to work on GSM. "Sorry to burst the celebrity bubble of Ernie Wise making the first cellular call on 1st January 1985 - As Beta testers we were using them from December 24th 1984 as part of the final test regime for the first Cellnet site on the Post office (BT) Tower." "Hi I own a Mobira Talkman hand held transportable mobile phone, one of the very first transportable phones available. Maybe you can help me, we are having a "vintage phone contest" with some friend, and some points will be given to the most expensive phone back in time. Does anyone knows the price of the microtac 5200 international (1994) when it was sold new ? You got a photo you can email? I'd be interested to see what it looks like! Is it the all white one? Wondering if anyone knows when NEC 204844-1A phones were made? "I WANT TO BUY CLASSIC CELLPHONE TO USE .BUT I CANT FIND IN IRAN . I LOVE SIMON BY IBM . PLEASE HELP ME TO FIND THIS . "What a brilliant website! Please keep up the good work. Brings all the memories of first generation cellular mobiles back. I remember moving to north Kent back in 1989 to get a job and sometimes people would be sitting on the train with a mobile phone and I was in awe. One day a regular guy who I always saw constantly talking into his phone dropped it on the platform and it broke in two... It was a dummy phone, just a shell!!! I bet the fake phone cost more than a real one does now. My first mobile was on the Cellnet network and it was a BT badged 'Pearl' handset. There was an advert in The Independent newspaper and I reckoned I could afford it. It was 1993 and I was still trying to live the yuppie dream. Calls were 50p/min weekdays and 20p/min evenings and weekends. The payphone in the hall at my lodgings was 54p/minute to Scotland at all times so even on a weekday the mobile phone was marginally cheaper. I can remember my number even now, 0850 276787. Wish I had kept the BT Pearl handset as a memento!!! There is a section on BT mobile phones, soon to be expanded. the catalogue also shows, a BT Roamer, also a different phone. There were several variations of this. The Pearl looks like rebadged Motorola flip phone without the flip. "In 1986 I was using a Motorola DynaTac 8000x as the portable unit of a 6000XL. The 8000x which transmitted 1.5 watts when portable was pushing out 3 watts while installed in the car using some linear amplifier which was a part of the 6000XL.installation. The telephone was used "Hands Free" and the battery of the 8000x was charged while driving and using the system. The 8000x needed to be in the charger/holder in order to operate in the car using the 6000xl handset. "I've just found an old bt ivory mobile that I've had for a good few years now I forgot I even had it ! Am I right in thinking that these are quite rare? I have recently come across my first mobile bought for me by my husband back in the 80's. I opened it Christmas morning and put it back in the box and its been in the loft ever since. I have never even turned it on!! I don't know if its worth anything to anyone, or how to go about finding out info about it. Its called a Motorola Traveller and has a carry case, aerial, car charger, battery and the phone. It also has a card with the dealers name on. Any info from you would be much appreciated. I own some of the bricks, as I am trying to establish a public mobile phones museum here in Slovakia. "Hello i have a Nokia (mobira) talkman 450 fully operating cell phone. With 12v cigarette charger and 230w charger. The battery is not charging anymore but the phone does work and look pretty and minor weare and tare. I see Phones of this kind on ebay is selling for insane prices - and they do not work or is compete..
"Hi, I have a Motorola MR1 fully boxed (inc plastic wrappers etc, instruction cassette, desk charger, battery all in pefect working order. Even the box is near perfect. Any idea of the value if I wanted to sell it ? Any info would be appreciated. eBay is the best place to sell. Look through completed listings to see how much similar items sold for. It is going to be worth from Â£10 to Â£30. "I have a Philips cellular Phone Type AP4000 purchased around 1987.I can find no reference to this anywhere.